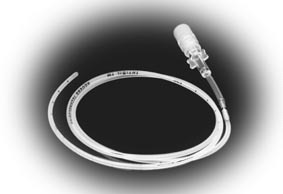 Chronic-Cath catheters are available with a preattached or an attachable female luer lock and injection cap. The pre-attached Chronic- Cath is provided with a female luer lock and an injection cap which are attached to the catheter during manufacture. The attachable Chronic-Cath is provided with a Pigtail Connector- a female luer lock and injection cap, with a 2,54cm Tygon extension, a silicone sleeve & barbed titanium connector. Chronic-Cath is available in Silicone, Polyurethane, Intisil and Hydrocoat. When choosing Intisil or Hydrocoat it is recommended to go for the attachable Chronic-Cath. Otherwise you have no possibilty to shorten the length of the catheter without losing the benefit of the rounded tip on these catheters. Pig Tail connector are also available seperately. See our attachment possibilities page.